Robert Foulis was a printer whose work had considerable influence on the bookmakers of his time. 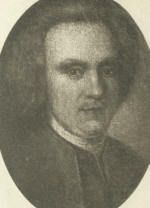 He was apprenticed to a barber; but his ability attracted the attention of Dr Francis Hutcheson, who strongly recommended him to establish a printing press. After spending1738 and 1739 in England and France in company with his brother Andrew, who had been intended for the church and had received a better education, he started business in 1741 in Glasgow, and in 1743 was appointed printer to the university. In this same year he brought out Demetrius Phalereus de elocutione, in Greek and Latin, the first Greek book ever printed in Glasgow; and this was followed in 1774 by the famous 2nd edition of Horace which was long but erroneously believed to be immaculate: though the successive sheets were exposed in the university and a reward offered for the discovery of any inaccuracy, six errors at least, according to T. F. Dibdin, escaped detection. Soon afterwards the brothers entered into partnership, and they continued for about thirty years to issue carefully corrected and beautifully printed editions of classical works in Latin, Greek, English, French and Italian. They printed more than five hundred separate publications, among them the small editions of Cicero, Tacitus, Cornelius Nepos, Virgil, Tibullus and Propertius, Lucretius and Juvenal; a beautiful edition of the Greek Testament, Herodotus, Greek and Latin, Xenophon, Greek and Latin; Gray�s Poems; Pope�s Works; Milton�s Poems. The Homer, for which Flax-man�s designs were executed, is perhaps the most famous production of the Foulis press. The brothers spared no pains, and Robert went to France to procure manuscripts of the classics, and to engage a skilled engraver and a copper-plate printer. Unfortunately it became their ambition to establish an institution for the encouragement of the fine arts; and though one of their chief patrons, the earl of Northumberland, warned them to �print for posterity and prosper� they spent their money in collecting pictures, pieces of sculpture and models, in paying for the education and travelling of youthful artists, and in copying the masterpieces of foreign art. Their countrymen were not ripe for such an attempt, and the �Academy � not only proved a failure but involved the projectors in ruin. Andrew died on the 18th of September 1775, and his brother went to London, hoping to realize a large sum by the sale of his pictures. They were sold for much less than he anticipated, and Robert returned broken-hearted to Scotland, where he died at Edinburgh on the 2nd of June 1776. Robert was the author of a Catalogue of Paintings with Critical Remarks. The business was afterwards carried on under the same name by Robert�s son Andrew.